I was a bit of a fan of monsters, mostly of the folk tale variety but also the classic Greek myths and the Universal Pictures classics. In fact, I started playing AD&D by picking up the Monster Manual first since it had all those cool creatures listed in it. Although I stopped paying much attention around the time I learned about the scientific method, I still have a bit of a soft spot for those cryptids. Enter Missing Linx. 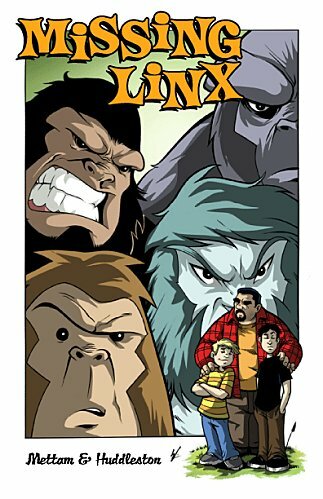 Owen Crockett is taking his two boys camping when they get caught in a battle between a Mantricore and a Sasquatch, Big Foot, Skunk Ape and Yeti. The primates defeat the beast and contain it using a shrink ray. As they decide what to do with the human witnesses, Dr. Bedfellow blows up a nearby nuclear power plant and they race to contain the damage. Bedfellow captures the humans and the team of ape-men launch on a race to save them (and the planet) from Bedfellow's machinations. A few battles later, as the good guys are on the verge of defeat, they're saved by a somewhat unlikely source and good triumphs over evil once again. Now, the idea of a Sasquatch type beast with a fair amount of intelligence isn't new to comics. Both Proof and Perhapnauts placed one in government agencies, and there were more than a few running around in The Yeti Wars. That's just in recent memory -- Jack Kirby put a talking Yeti in Fantastic Four #99 back in 1970. So, Missing Linx isn't original in that respect. That they're teamed up here does make for some interesting contrasts in character personalities. There's some interesting parallels with the Fantastic Four, but I suspect that's somewhat inevitable given the number of heroes we're talking about. The story itself isn't terribly complex, but it flows along pretty smoothly. I wasn't previously familiar with Dale Mettam's work, but I certainly enjoyed Courtney Huddleston's art back on A Bit Haywire. As in that book, Linx is friendly and approachable, but far from saccharine. Perhaps most notably impressive is the distinct visuals for the four protagonists that, normally, would be drawn almost identically. But Huddleston provides unique visuals for each that suit their respective personalities. Overall, it was a fun book. I might've liked to seen a tad more character development on Big Foot and Owen but it is a decent sized cast for a fairly short book. And the ending does suggest further adventures await. As I said, it's not as complex a story as you might see in Proof but it would definitely be a good way to catch a younger reader's attention and interest in cryptid-human relations in comics!